Thyroid cancer starts in the thyroid gland, which is below the thyroid cartilage in the front part of the neck. It is normally butterfly shaped with a right and left lobe. 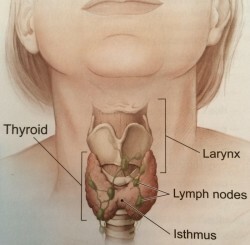 Thyroid cancer starts in the thyroid gland which sits in front of the lower Adam’s Apple. Risk factors include radiation exposure and family history. Many types of growths and tumors can develop in the thyroid gland. Most of these are non-cancerous, but others are and can spread to other parts of the body.